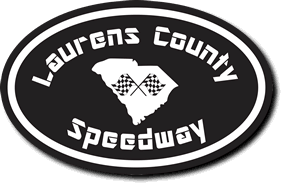 Saturday night brought the fourth weekend of Laurens County Speedway racing season to the Darlington of Dirt, and the Front-Wheel Drive Division found itself in the marquee position with a $1,000-to-win main event and 17 drivers who took part in the main event. And of the 17 drivers, Eddie McGrew took full advantage of his night in the spotlight. McGrew held off J.J. Williams to take the checkered flag in the main event, his first victory of the season. Hunter Anthony was third in the main event, while Spud Ammons took fourth and Jay Johnson was fifth. The field qualified for the main event in groups of three, with McGrew’s time of 19.238 seconds proving to be the best of the bunch. Jonathan Sarratt was the second-best qualifier at 19.522 seconds, with Johnson following in third at 19.949 seconds. The trio were the only drivers to finish qualifying for sub-20-second laps. Sarratt got off to a good start in the main event, winning a quick battle with McGrew for the top spot before a caution came out on the second lap. Sarratt kept hold of the lead through some early cautions that continued to thin the field, but he lost the lead after McGrew maneuvered his way to the front on the backstretch. Sarratt, on the sixth lap, ran into trouble with his car and had to exit the race. McGrew continued to hold the lead as the race passed the midway point, while Williams held second place – but could eventually get no higher up the standings. After the final restart, with five laps to go, Williams saw McGrew use a good restart and eventually pull away to end any hope of a last-lap duel. Limited: Billy Rushton notched his first victory of the season in the main event of the Limited Division. Michael Smith continued his hot start to the season by finishing second, while Chris Lyons was third. Rushton’s night got off to a great start when he won the pole position in qualifying, posting a time of 15.223 seconds. The time edged out Smith by .034 seconds, and helped set the stage for the main-race battle that developed later in the night. Rushton led from start to finish, and held leads of more than a second for vast chunks of the race, but Smith got his chance to pass Rushton when a caution flag came out three laps short of the finish. On the restart, however, Rushton used a strong jump and put enough separation between himself and Smith to close out the victory. Thunder Bombers: Bobby Tucker won his second straight main event at the speedway, benefitting from trouble up in the front of the field. Shane Roberts was second and David Stone was third. At the start of the race Bill Faulks found himself at the front of the field with Roberts following in second place. The driving was active throughout the field but the leaders kept hold of their spots. 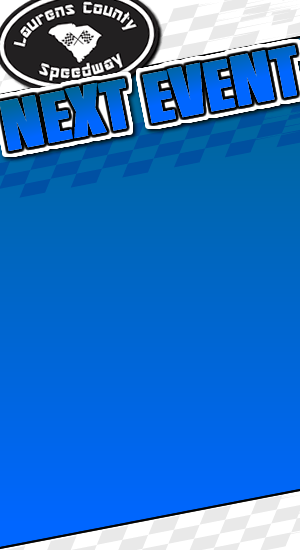 It appeared, in fact, that Faulks had the race in hand before a caution came out on the eighth lap, but the action really picked up when there was a caution on the ninth lap and Faulks first losing the first spot to Dylan Chappell, then blowing his engine to fall out of the race. Chappell moved up to first but he spun out on the next lap, ending his night. 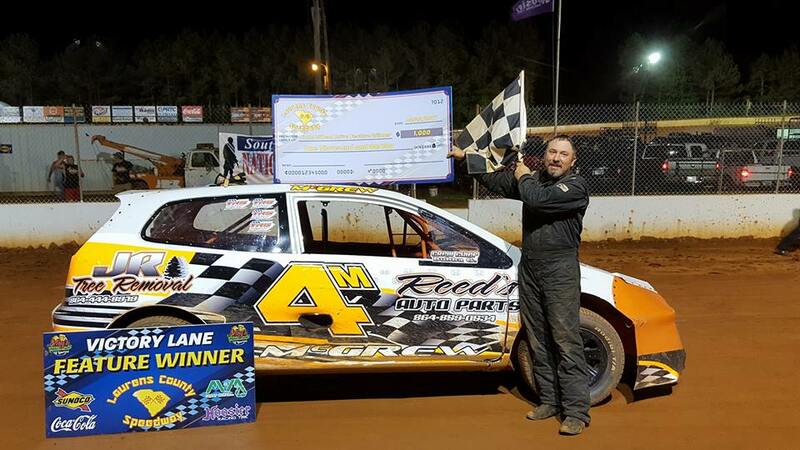 Casey Lawson inherited the top spot, but he fell out after he blew a tire – and it was that blown tire that put Tucker into first place for the remainder of the night. SECA 604 Crate: Ray Storay kept up his solid start to the year by returning to Victory Lane after winning the main event. Steven Bowie was second and Michael Akeson third. The caution-free race saw Storay and Bowie start at the front after both took the top spots in qualifying. Storay had the top lap of 15.903 seconds, barely edging out Bowie (15.921 seconds) for the pole position. Storay pushed the pace from the start, but quickly found Bowie was up to the challenge early on. As the laps went on Storay built a lead of more than one second, and eventually pulled away for a comfortable victory. 602 Crate: Mart Patterson kept up his control of the LCS track, winning his third main event of the young season. Chris Patterson was second and Butch Riddle third. In what was a clean race Mart Patterson jumped out to the lead at the start and never lost it, even as both he and Chris Patterson ran into lap traffic late in the race. Chris Patterson closed the gap at times, but could not get close enough to make a pass for the lead and settled for second. Monster Minis/Stock 4: Larry Teal came through with the victory in the main event. Phillip Wilson was second and Nick Coleman was third. Teal took the lead on the second attempted start and won wire-to-wire, pulling away to a healthy lead early in the race. Wilson ultimately moved into second place after qualifying sixth following the heat races. Wilson tried to find a way by as the laps went by, but he never found the winning path.